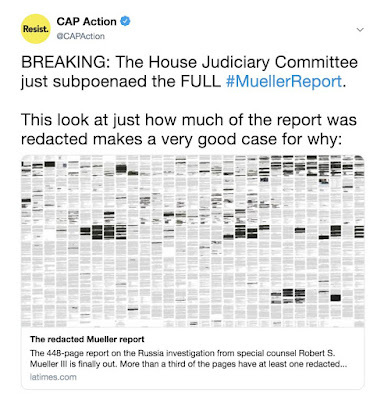 What the release of the redacted Mueller Report proves [image above]--and US Person thinks it proves a lot including the impeachable offense of illegal campaign finance contributions--is two fold: one, the decision not to indict Don Veto for obstruction of justice was a policy decision, not one based on the evidence. DOJ has a policy of not indicting sitting presidents¹ contained in two Office of Legal Counsel memorandums; two, any "fake news" about the so-called "witch hunt" is only that created by the Very White House's extensive propaganda machine. There may be no evidence beyond a reasonable doubt of Don Veto's collusion with foreign agents (Russia's Internet Research Agency) running a "sweeping" agitprop operation intended to undermine our political institutions, but as columnist David Brooks points out, while there was no evidence of illegal conspiracy, "[the report] also shows that working relationships were beginning to be built, through networkers like Paul Manafort, Donald Trump Jr. and Roger Stone. More important, it shows that many of the Trumpists, the Russians and the WikiLeaks crowd all understood that they were somehow adjacent actors in the same project." Trump said nothing--worse, he publicly denied what was going on in the shadows². As one Democratic congresswomen put it, "Eisenhower would not recognize this presidency." The bottom line is: Individual I had guilty knowledge of foreign influence in the 2016 election. If an ordinary individual has knowledge of a felony being committed and does not report it to authorities, that person could be prosecuted for being an accessory to the crime. If you are President under oath to protect and defend the Constitution of the United States, not so much. His disloyalty is astonishing. Mueller generally corroborates reporting on the Russian Connection investigation which began as an FBI counterintelligence investigation code named "Crossfire Hurricane", and tosses the ball to Congress on the issue of obstruction. Mueller wrote, "If we had confidence after a thorough investigation of the facts that the president clearly did not commit obstruction of justice, we would so state." "Based on the facts and the applicable legal standards, we are unable to reach that judgement." If the congressional investigations go forward on a legitimate basis, and it seems at this point they will, impeachment will be necessary to uphold the integrity of the country's justice system. Trial in the Senate is for another day. Wackydoodle sez: Garunteed to get the dirt out! in 1973 and another in 2000, were written by DOJ lawyers working for an Executive Branch werein a chief executive was under threat of impeachment for wrongdoing. In 1973 it was Nixon bag man Spiro Agnew; in 2000 it was the morally unreliable Bill Clinton. Scholars have called the opinions "shaky and political"
²As expected--for no sovereign nation engaged in espionage voluntarily gives up the principle of plausible deniability--the Kremlin continues to deny that it interfered with the 2016 election. 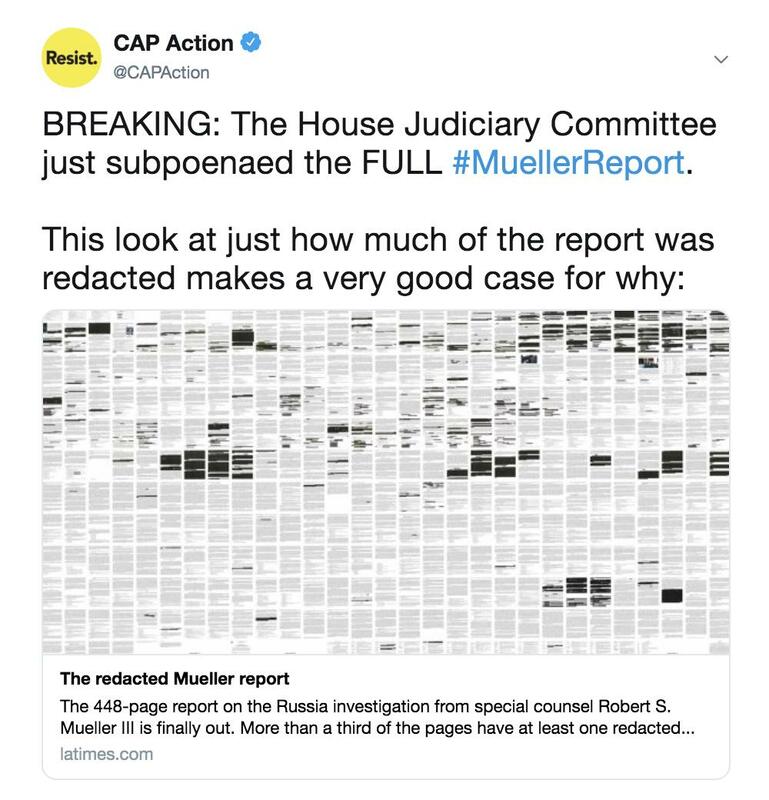 It suggests the Mueller report is "low quality" and a waste of American taxpayers' money. To all those pundits counting senators on their fingers, US Person would like to remind them Bill 'Issy' Clinton escaped conviction by only one vote, and Nixon resigned rather than be tried. The point being that the evidence eventually amassed against this President may be so clear and convincing that even Repugnants could not afford politically to exonerate the pseudo mobster, Don Veto Trumpilini. And what if Congress abdicates its constitutional duties by leaving the removal of a corrupt president to the voters in another demonstrably unrepresentative election, as suggested by some inexperienced presidential candidates? If he wins again, the demigod would justifiably declare complete and total victory over "democracy". No governmental institution would then be capable of stopping his march to fascist dictatorship. It is well known that Deutsche Bank has a 'special relationship' with Don Veto. The bank was lending him money when no one else on Wall Street would bear the "Donald risk". Now, the House Intelligence and Finance Committees want to know why Deutsche gave such favorable treatment to the bankrupt welsher. US Person wishes to suggest why the connection exists in two words: money laundering. When the Soviet Union collapsed in 1991, billions in formerly state owned assets were ferreted out of the country during the ensuing chaos. A lot of that money ended up in western banks, especially Deutsche Bank. The bank had money to burn, so to speak, so why not invest it in Trump-owned real estate and businesses? The parties sued each other over rotten deals, but already in a co-dependent relationship, they continued to do business. Trump still owes the bank hundreds of millions, and he keeps substantial millions in Deutsche wealth management accounts. On Monday, Congressional investigators subpoenaed records from the bank regarding its loyal customer, as well as records from Citicorp and Chase. “The potential use of the U.S. financial system for illicit purposes is a very serious concern,” Representative Maxine Waters, the chairwoman of the Financial Services Committee, said in a statement. Don Veto may have been a witting enabler of the washing scheme, so his relationship with Deutsche is coming under intense scrutiny. Russian mobsters were known to frequent Trump's Atlantic City casino, perhaps to keep an eye on their money. If US Person were forced to speculate, Russian money laundering operations may be the source of kompromat, which explains Don Veto's conspicuous policy tilt towards the Kremlin. Deutsche bank has lent over $2 billion to Individual I, and he is the bank's biggest creditor at $300 million in debt. According to investigating officials, the bank is cooperating with the committees' record demands. A joint subpoena has been negotiated for two months; the bank wanted to limit its scope to reduce its compliance costs and speed up production. The family owned Trump Organization, speaking through son Eric Trump, is understandably unhappy with the probing saying it "sets a horrible precedent for all taxpayers". The feds are not the only ones interested in Trump-Deutsche dealings. The state of New York has also issued its subpoena for bank records. I do not know about you dear reader, but US Person does not owe anybody $300 million. When you owe that much to a bank, you become a business partner, not just a customer. 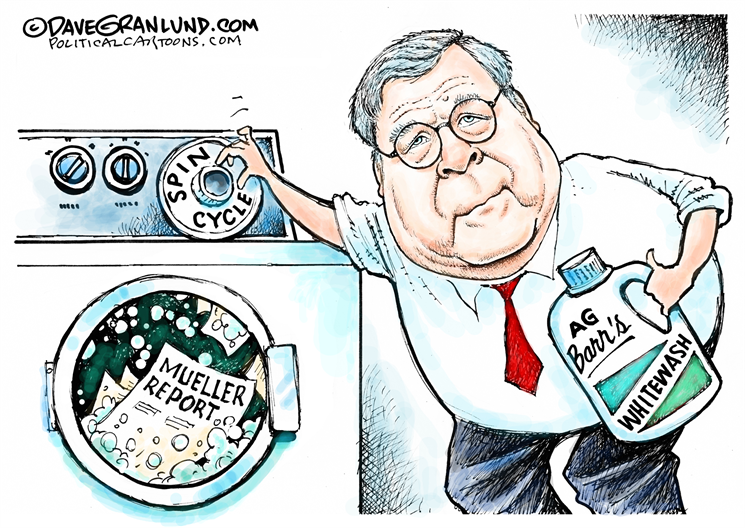 As they say in DC, 'the truth will out'; just ask William Barr. Experts say the crossover to electric will begin in Europe for larger vehicles in 2022. Europe has much less distance between urban centers than the US, and a more highly developed electric charging system. "Range anxiety" is holding US consumers back from embracing the newest mode of transportation early. 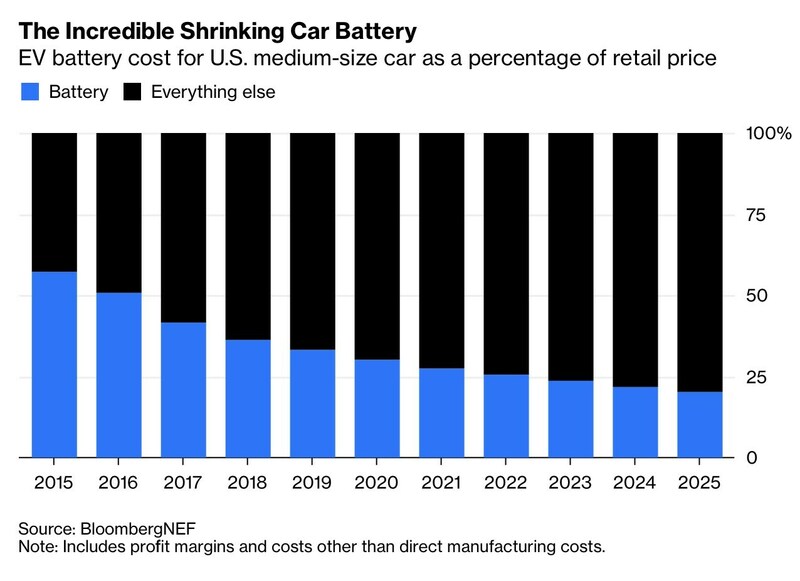 But more efficient batteries are increasing driving range to as much as 500 miles, similar to the range of a gas powered vehicle. Next generation batteries may be rechargeable in as little as 3-5 minutes! 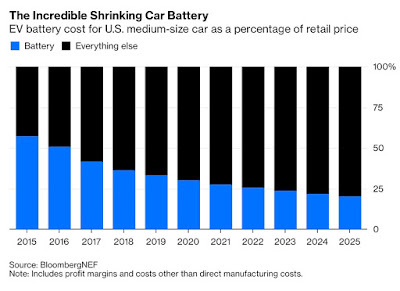 Other critical parts of an EV like the electric power train, are also becoming cheaper as mass production gets underway. Key parts could become 30% less expensive over the next decade. So full speed ahead for the old, new electric car. One of the consequences of a rapidly warming Arctic region is large scale melting of the permafrost. 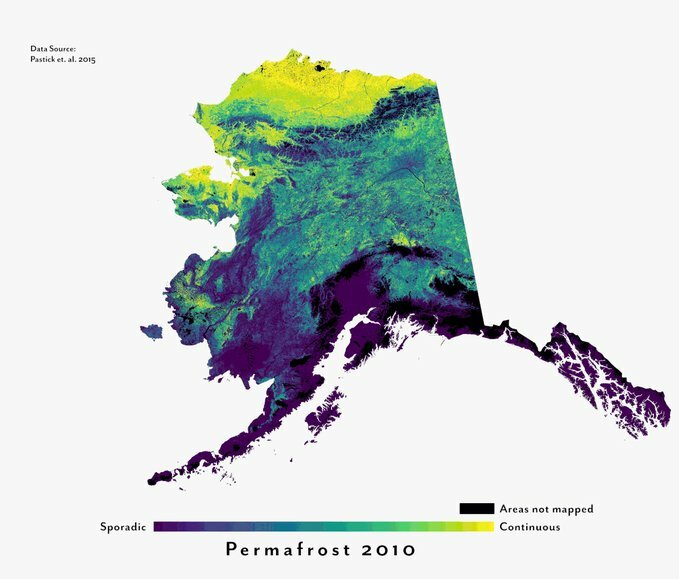 This map shows the continuous melting of permafrost on Alaska's North Slope. [yellow] Profit obsessed climate deniers ask, so what? Permafrost is a huge carbon sink; it currently covers about 5.8 million square miles. When it melts, carbon in the form of methane gas and carbon dioxide from decomposing organic material is released to the atmosphere, augmenting the greenhouse gas effect and warming the planet even more. Methane gas is a more potent climate pollutant that causes a difficult to stop feedback loop. 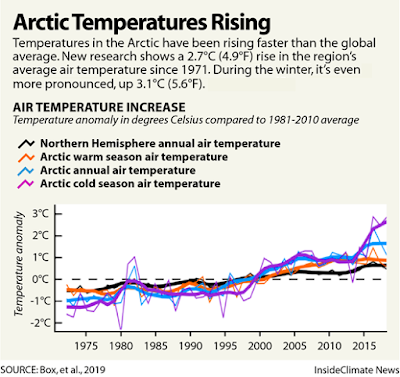 Scientists specializing in this phenomenon have been warning for years that this feedback has not been taken into account when setting climate goals. The most dramatic change has occurred in Siberia where deep permafrost temperatures have risen by 1.6 ℉. In fact recent research has revealed that the Arctic is warming 2.4 times faster than the rest of the Northern Hemisphere [chart below], which brings a host of cascading ecological effects that is transforming the region to an "unprecedented state". Warmer temperatures have shifted forest and tundra growing seasons, boosted rain and snowfall, increased melting, accelerated glaciers and possibly even increased the number of lightning strikes that could increase the risk of Arctic wildfires in the tundra and boreal forest, according to Jason Box, a scientist with Denmark's Geological Survey and lead author of a study of the last 50 years of temperature data published in Environmental Research Letters. 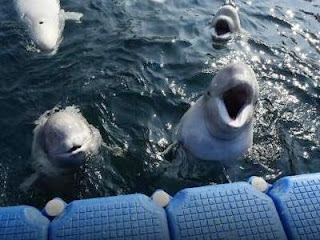 Russian officials have agreed to release whales from cramped sea pens that amount to a gulag for whales. Eighty-seven beluga whales [photo] and ten orcas are incarcerated at Nakhodka, Primorski for sale and distribution to aquariums in China and elsewhere in Asia. Regional Governor Oleg Kozhemyako told reporters that an agreement in principal was reached with Jean-Michel Cousteau, heir to the oceanographic legacy of his father Jacques, and the Whale Sanctuary Project to free the whales. A joint team of Cousteau and Russian scientists will decide when and which animals to release to the wild this summer. After all the whales are set free the "whale jail" will then be closed after months of outcry from animal rights advocates including 1.5 million signatures on a petition demanding their release. Even Canadian born actress and model Pamela Anderson, who identifies as ethnically Russian, contacted President Putin to express her concern for the intelligent cetaceans, whose basic biological needs require they swim and dive freely, caught in an inhumane trade of marine mammals to supply exhibitors. The whales where first captured last summer by companies planning to sell them to marine parks and aquariums. The Kremlin intervened and order local authorities to act. The FSB charged the four firms with violating fishing laws; whales can be legally captured in Russia but only for scientific and education purposes in specific circumstances.